Westons Cider is situated in the Herefordshire countryside on the A449 between Ledbury and Ross-on-Wye. Guided Mill Tours at 11.00am, 12.30pm, 2.00pm and 3.30pm daily. Cider Shop open daily. Free Parking, Free Play Park. 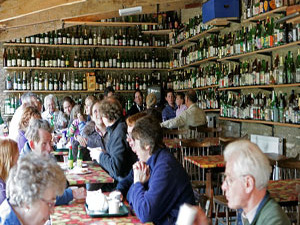 Enjoy a cup of tea in our Cider Bottle Museum Tea Room amongst the largest collection of cider bottles in the world! Our Tea Rooms, is a converted 17th century cow shed and proudly houses over 1000 cider and perry bottles. This collection is believed to be the largest in the world and was kindly donated to Westons on permanent loan from Ian and Gill Horsley, formally of the Brandy Wharf Cider Centre, Waddingham, Lincolnshire. They began their collection by keeping an example bottle of each cider and perry they sold which they put on display for their customers to enjoy. Word soon spread and visitors brought them examples of products from their travels throughout the UK and abroad! Westons continue to add to this historical collection. Come and marvel at the collection, with its quirky bottle shapes and humorous cider names and labels. You can even enjoy a cup of tea and slice of homemade cake as you explore.